Though I appreciate and like most of Marvel’s Avenger’s related films, the only Marvel Universe film that I have been truly excited for is Deadpool. Unfortunately for me, I’ll have to wait several months before I can watch it because, living in Japan, it doesn’t come to theaters here until June. But in the spirit of the release of Deadpool, and since it is one of the few Deadpool-related things I am even able to review for this column, I’ve decided to talk about the Ultimate Spider-Man episode known as “Ultimate Deadpool.” This 16th episode of the series’ 2nd season is the only episode of the show I’ve seen, so I cannot compare it with the series as a whole. However, I can appreciate a random animated episode of a superhero show in which Deadpool hijacks the plot. Some issues I have with the episode include the constant rapid-fire jokes and puns, making it hard to keep up with the dialogue. Though this does actually make a lot of sense when you consider that this episode centers on “The Merc with a Mouth.” The final fight scene is also a bit all over the place with the two heroes fighting, along with the supervillain, Taskmaster in the mix. The episode ends with a moral in which Deadpool reveals his “origin story” (though we can’t be too certain if this origin story is true, since Deadpool gives us several versions throughout this episode). It is a little heavy handed and Spider-Man’s aside to the audience feels like a PSA. But overall, the story manages to wrap itself up nicely, with Spider-Man ultimately winning by making Deadpool “feel emotions and stuff,” which is a great twist since he’s basically winning by grounding Deadpool to reality. Looking at it this way, it is a really clever episode and super fun to watch. Deadpool is an enjoyable character, no matter what medium he is in. I find it a shame that he isn’t present more in the animated medium, as his cartoonish nature would work well in that context. 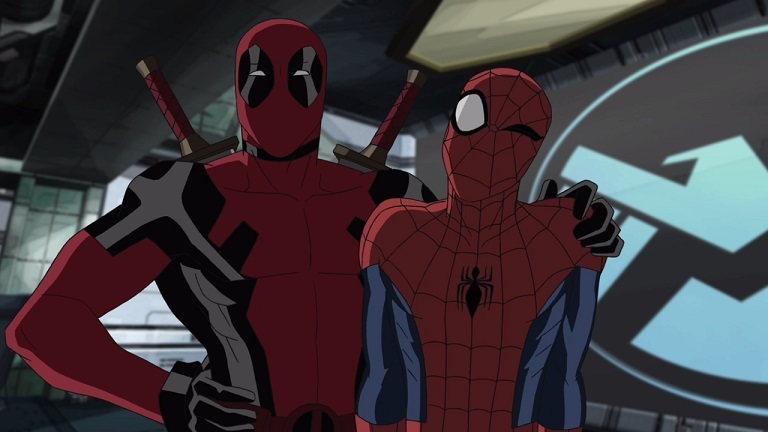 I don’t know about the rest of Ultimate Spider-Man, but this particular episode is really worth a viewing, especially if you enjoy the kind of humor that a character like Deadpool provides.